Though the impact that the new social media habits may have in the jazz scene hasn’t been adequately documented yet, there is a rather safe assumption to be made: you know that a gig went well, when the participants are willing to take a backstage selfie. 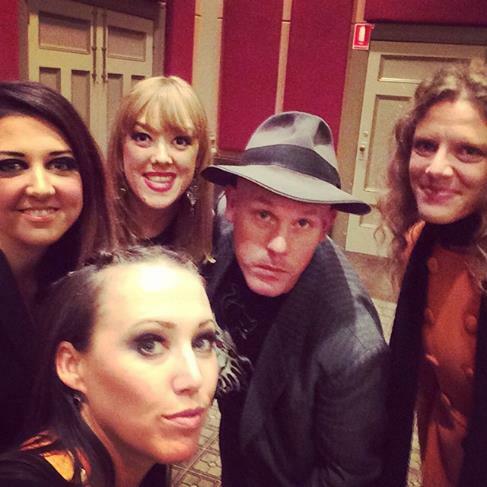 The photo in question appeared on Fem Belling‘s instagram account and it features the singer, along with Chelsea Wilson, Elly Hoyt, Kristin Berardi and Adam Rudegeair. The four vocalists combined forces in a heartfelt and heartening tribute to Australia’s “first lady of jazz”, Kerie Biddell. The concert has been one of the many highlights of this year’s edition of the Stonnington Jazz Festival. Adam Rudegeair provided another one, presenting his exciting interpretation of the David Bowie songbook from a jazz perspective at a sold-out concert. It has been a busy week, with an army of great artists – among them Andrea Keller, both with her quartet and with her (and Miroslav Bukovsky’s) Komeda Project, as well as iconic figures, like George Golla, or even Allan Zavod – offering a panorama of australian jazz. The same balance of great art and great fun will go on during the weekend, as the Festival will get into climax. Cabaret diva Mama Alto presents a luscious tribute to Sarah Vaughan, Paul Williamson leads an electrifying band and of course, the whole thing will end with a massive jazz party, a free one. In fact, the festival’s free functions are plenty and exciting and listed here. So, yes, a lot happening around Stonnington, these days. In the words of Fem Belling: “Some mighty fine peeps. Some mighty fine tunes”.